These beaches near Los Angeles are family friendly and full of activities from people watching to surfing to swimming to sunbathing. Two of the most iconic places are Venice Beach where you will find Muscle Beach and Santa Monica State Beach which boasts the Santa Monica Pier and 3.5-miles of sand. 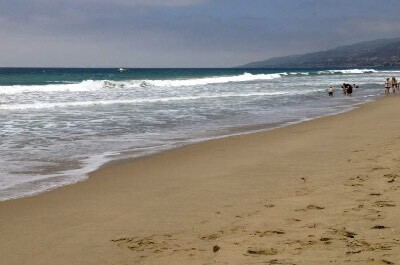 Swimming is ideal at Paradise Cove and Zuma Beach is a perfect place to sprawl on the sand. Expert surfers will enjoy the Malibu Surfrider Beach and novices can try out Hermosa Beach. Manhattan and El Porto Beaches are ideal for relaxing and playing beach volleyball. 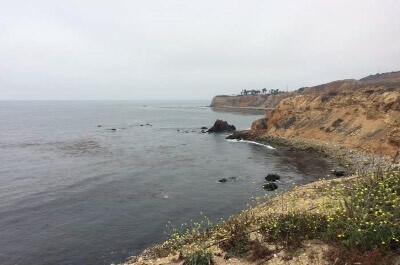 If you are looking for coastal scenery try the Point Dume State Beach Preserve which is superb for whale watching or El Matador Beach which is packed with interesting coastal rock formations and you will like the seclusion found at Leo Carrillo State Beach. If you are seeking a diverse beach near Los Angeles that boasts great people watching, plenty of sand and lots of attractions then you need to visit Venice Beach. Located in the Venice District of Los Angeles, Venice Beach stretches from the Venice Pier north to Santa Monica State Beach and is packed with everything from a skate park to beach volleyball courts to eclectic artwork along the boardwalk. Venice Beach is centered on the famous Muscle Beach portion that offers a wide variety of sports facilities that include weightlifting, beach volleyball, basketball, tennis and racquetball courts as well as a large skate park directly on the beach. Venice Beach sports great watersport activities such as swimming, windsurfing, kite boarding, parasailing and surfers are intrigued by the Venice Breakwater. You will find other land based exercise opportunities for biking, roller skating, walking or jogging on the 26-Mile Bike Path. Along the Venice Beach Boardwalk you will find numerous vendors with unique artwork, restaurants and other boutique shopping venues as well as a plethora of street performers from dancers to musicians to magicians. Facilities onsite include lifeguards, restrooms, showers and a children's play area. When you are interested in a beach near Los Angeles that features numerous activities and is ideal for families as well as all types of beach goers then the Santa Monica State Beach is an ideal choice. Located west of downtown in Santa Monica, the Santa Monica State Beach is a 3.5-mile stretch of sand that is separated by the Santa Monica Pier. The northern section offers a wide strand that is perfect for lounging and playing games. There are numerous beach volleyball courts and other sports courts as well as a freshwater swimming pool found at the Annenberg Beach House. 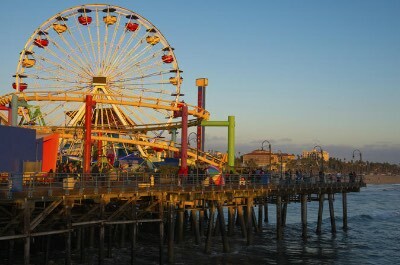 At the Santa Monica Pier you will find numerous restaurants, an amusement Pacific Park complete with rides as well as arcade games and the Santa Monica Pier Aquarium. The southern portion features several grassy park areas along with golden sand and the original Muscle Beach. Water activities at Santa Monica State Beach include swimming, surfing and fishing is allowed from the pier. The 26-Mile Bike Path of this beach near Los Angeles is a perfect spot for biking, walking, roller skating or jogging. Other facilities onsite include lifeguards, children's play area, restrooms and showers. One of the more scenic beaches near Los Angeles for beach goers who are searching for idyllic coastal scenery is the El Matador State Beach. Located northwest of downtown in Malibu, El Matador State Beach resides within the greater Robert H. Meyer Memorial State Beach and is south of El Piedras Beach as well as El Pescador Beach. The El Matador State Beach is a pocket cove beach and is accessed from walking down a trail from atop of a bluff. The beach area offers opportunities for sunbathing as well as swimming and many people will go snorkeling around the sea stacks offshore. El Matador State Beach is a wonderland of rock formations that you can explore around the shoreline. Formations include arches and numerous sea caves which are also a favorite for photographers and sunset watchers find the formations enchanting as the sun goes down. There are picnic tables in the bluff parking lot and port-a-potties but no other facilities are available. Zuma Beach is one of the largest and most spacious beaches near Los Angeles that is perfect for all types of beach goers including families. Located 1-hour from downtown Los Angeles in Malibu, Zuma Beach is a 2-mile stretch of white sand that features plenty of activities in and out of the water. Zuma Beach has plenty of space for you to lounge as well as play games and there are numerous beach volleyball courts for you to use. Kiteboarding and windsurfing are popular in the afternoons here because of consistent wind patterns. Surfers take advantage of the breaks offshore and wake as well as boogie boarding is popular. 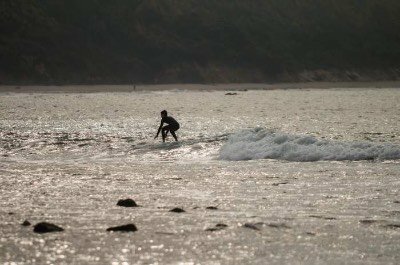 Other water activities at Zuma Beach include snorkeling, scuba diving as well as swimming when the rip tide is not too strong. During the summer months you can view sea lions and pods of dolphins swimming offshore. Zuma Beach is a popular filming spot for Baywatch and the final scene from Planet of the Apes was shot in the southern portion. Facilities onsite include numerous lifeguards, restrooms, showers, picnic tables, children's play area and concessions stands. Point Dume State Beach Preserve is a superb beach near Los Angeles for beach goers looking for a little seclusion mixed with other outdoor activities. Located 1-hour northwest of downtown Los Angeles in Malibu, Point Dume State Beach Preserve is a combination of great sandy beaches resting below towering ancient coastal dunes within a 63-acre nature preserve. 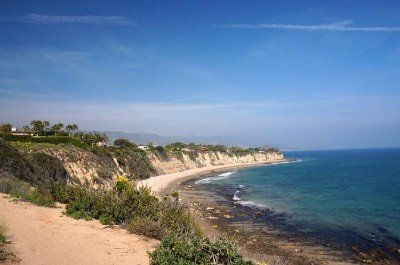 The Big Dume Beach is crescent-shaped and is accessed from a steep staircase that descends from the top of bluffs. Big Dume Beach offers solitude, tide pooling opportunities and swimming. 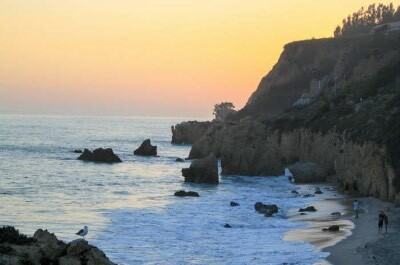 You will find Pirates Cove Beach and Westward Beach north of Point Dume. These beaches boast seclusion, sea caves and interesting rock formations. Other water activities at Point Dume State Beach Preserve include kayaking, snorkeling, scuba diving and surfers will take advantage of days with big breaks offshore. Point Dume State Beach Preserve has 2-miles of nature trails which will take you to the top of the bluffs which are perfect for viewing migrating whales during the winter months. Rock climbing is popular on Point Dume with several ropes lines already laid in place. There are facilities in the parking lot like restrooms and showers but nothing on the beaches. 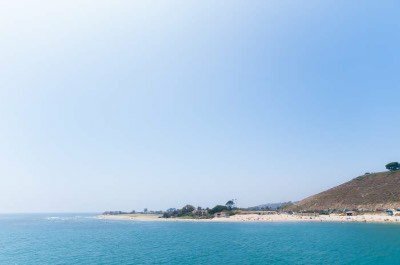 The Paradise Cove Beach is one of the most family friendly beaches near Los Angeles with a tranquil atmosphere which is perfect for fun. Located 1-hour northwest of downtown Los Angeles, Paradise Cove Beach in Malibu is situated between Malibu Canyon Road and Point Dume. Paradise Cove Beach sits in front of a privately owned restaurant which is adorned by surf boards. The stretch of sand is nice with room to lounge and families will enjoy the non-smoking, no alcohol and no loud music policies. The water at Paradise Cove Beach is perfect for swimming with light surf and no waves. Tide pooling and beachcombing are popular with individuals as well as families. The calm water condition makes for great kayaking as well as standup paddleboarding. Paradise Cove Pier is superb for whale watching and for fishing with plenty of benches. The Paradise Cove Beach Cafe offers comfortable seating under umbrellas for you to indulge in lunch or a libation and offers discounted parking rates with a minimum purchase. Other facilities at Paradise Cove beach near Los Angeles include restrooms and showers. There are no lifeguards located at Paradise Cove Beach. When you are seeking one of the premier beaches near Los Angeles for surfers and people watching then a trip to Malibu Surfrider Beach is a perfect choice. Located northwest of downtown Los Angeles within the Malibu Lagoon State Beach, Malibu Surfrider Beach is situated between the Malibu Pier and the Malibu Lagoon. The beach area here has nice golden sand boasts plenty of space for you to lounge and there is a designated swimming area away from surfers. As the name would suggest the Malibu Surfrider Beach is ideal for surfing with three distinct breaks. The first point is perfect for long boards with smooth waves that are long and consistent. The second point the waves break faster into barrels and the third point is superb for short boards with fast waves. There are scuba diving opportunities offshore at Malibu Surfsider beach near Los Angeles and there is one beach volleyball court for you to enjoy. The Malibu Sport Fishing Pier is popular for fishing and you can also visit the historic Adamson House Museum which is located near the lagoon. Other facilities include lifeguards, restrooms, showers and children's play area. Hermosa Beach and Pier is a great beach near Los Angeles for families who want to spend the day relaxing with lots of amenities within a short distance. Located southwest of downtown Los Angeles between Manhattan Beach and Redondo Beach, Hermosa Beach has a nice stretch of golden sand and boasts plenty of watersport activities. The beach area is a wide 2-mile strand that allows for plenty of space to lounge or play and the most heavily populated area of the beach is around the Hermosa Beach Pier. Hermosa Beach has good swimming and windsurfing opportunities as well as surfing. The beach is well-known for surfing with weaker breaks for beginners or intermediate surfers and is considered to be one of the many cities that call themselves the birthplace of surfing in California. There is plenty of beach volleyball courts for you to use located along the whole stretch of beach. The pedestrian only Hermosa Beach Pier is lined with benches and allows fishing without a license. The pier is surrounded by numerous restaurants and retailers but there are none directly on the pier. The 26-Mile Bike Path that runs adjacent to Hermosa Beach is pedestrian only and you must walk your bike. There is a bike lane on Hermosa Avenue to bypass this section. Other facilities include lifeguards, restrooms, showers and a children's play area. When you are looking for the best beach near Los Angeles for volleyball and surfing that is family friendly then you should plan a trip to Manhattan Beach. 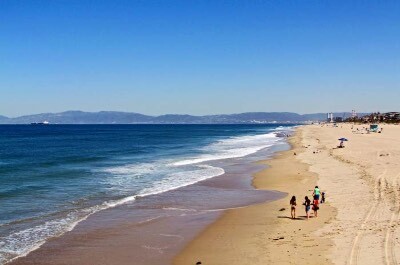 Located southwest of Los Angeles near downtown Manhattan Beach, Manhattan Beach stretches from 1st Street to 45th Street along the Pacific Ocean coastline with a width of 400-feet which is ideal for beach goers. Manhattan Beach has a wide strand of golden sand for you to soak up the sun on and swimming close to shore is generally good. Manhattan Beach boasts some of the best left as well as right breaks for surfers to carve and windsurfers will have fun. Beach volleyball is very popular at Manhattan Beach with nearly 100 courts for people to use. Scuba divers can also be seen exploring the underwater world. 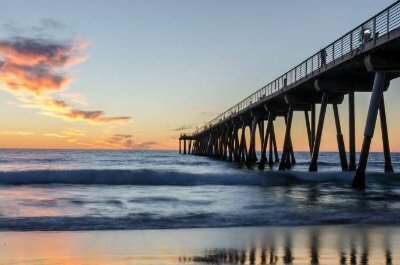 You can go fishing on the Manhattan Beach Pier as well as visit the Roundhouse Aquarium. The 26-Mile Bike Path of this beach near Los Angeles runs adjacent to the beach allowing for biking, roller skating, jogging ad walking. There are numerous facilities such as lifeguards, restrooms, showers, a workout area and a children's playground. If you are searching for a less crowded beach near Los Angeles area that boasts tremendous surfing opportunities and plenty of white sand then El Porto Beach is a great selection. Located southwest of downtown Los Angeles in the El Porto neighborhood, El Porto Beach is the northern section of Manhattan Beach and stretches from 38th Street to 45th Street in north. El Porto Beach has perfect white sand for you to enjoy with plenty of space for beach games and there are numerous beach volleyball courts. Surfing is the biggest attraction at El Porto Beach with larger than normal waves with left and right breaks which are challenging for most surfers. You can take a surfing as well as a standup paddleboarding lesson at Campsurf and the Surf Food Stand where there are chairs, tables and umbrellas. El Porto Beach also provides great access to the 26-Mile Bike Path which offers bicycling, roller skating, jogging and walking opportunities. Other facilities at El Porto Beach include lifeguards, restrooms and showers. 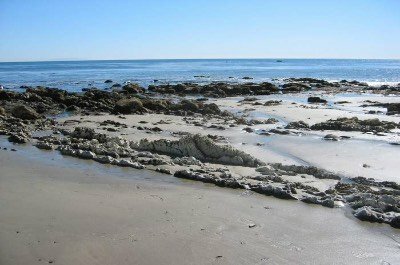 Leo Carrillo State Park is an ideal beach near Los Angeles for all types of travelers including families who are seeking multiple outdoor activities in one place. Located 28-miles northwest of Santa Monica along the Pacific Coast Highway, Leo Carrillo State Park is situated within 2,513-acres that features 2.5-miles of coastline which includes 1.5-miles of beach and 1-mile of cliffs and bluffs. Leo Carrillo State Park boasts numerous attractions from hiking to swimming to camping to multiple watersport opportunities. The golden sand beach area has plenty of space to lounge and good swimming conditions along with surf fishing, beachcombing, windsurfing and surfing opportunities. The Pacific Ocean area has several reefs, tide pools and has created several sea caves to explore at low tide. Leo Carrillo State Park contains 7-miles of hiking trails that range from the easy Yellow Hill trail to the moderate Leo Carrillo Beach trail to the hard Nicholas Flat trail. The popular campground has many shaded areas which are provided by giant sycamores and there is a visitor's center that contains numerous interactive exhibits about the surrounding ecosystem as well as wildlife. Other facilities at this beach near Los Angeles include lifeguards, restrooms, showers and a small general store.